It's been almost a month since the attack on Charlie Hebdo. I usually don't make comics immediately after an event. Most of the time I don't make anything for at least few months. I like to have time to think about the event, to decide what I want to say about it. It's really easy, after a tragedy like this, to look for a scapegoat and to forget two things. The other thing we forget is that they are individuals. Their actions don't speak for anyone who hasn't specifically stated that they support those actions. This is as true for victims as it is for innocent people who have anything in common with the attackers. Often, I hear Muslims apologizing for the actions of other Muslims, even though they were total strangers. They shouldn't feel so compelled, just like Christians shouldn't feel the need to appologize for Christian terrorists like the Lord's Resistance Army in Uganda or Anders Breivik's summer-camp shooting in Oslo in 2011. No one should ever feel the need to apologize for other members of their church, race or country. Responsibility is personal and while it may satisfy some immediate hurt surrounding the event, in the long run, blaming everyone who is like them in some way is counterproductive. I've also heard some people denounce Charlie Hebdo for being racist. The problem is that it doesn't matter if they're racist, sexist, ageist, ableist, etc. Whatever ism you want to attach to the victims, no one was ever literally injured by their freedom of expression. The value of human life is always of greater importance than whatever prejudice they might promote. The people of Charlie Hebdo have the right to say whatever they want to say, and while they may lack the ability, they have the right to say it without fear of being physically injured or killed for doing so. I believe there is something of greater importance than human life - freedom of speech. One of the Hebdo Cartoonists, Rénald Luzier, did survive. I found this interview, which is understandably difficult for him and even a bit difficult to watch. He's grappling with a lot of things: his friends died, Charlie Hebdo has become a symbol of free speech, and some people who obviously don't believe in free speech draping themselves in that symbol. And yet despite his pain, he's finding comfort and continuing on. We all experience loss. We all need to greive. We all need compassion, comfort, understanding. We all need hope. And we all need to pick ourselves up, dust ourselves off, and let everyone know that we're not just going to survive, we're going to thrive. Let's get back to doing what we love! p.s. 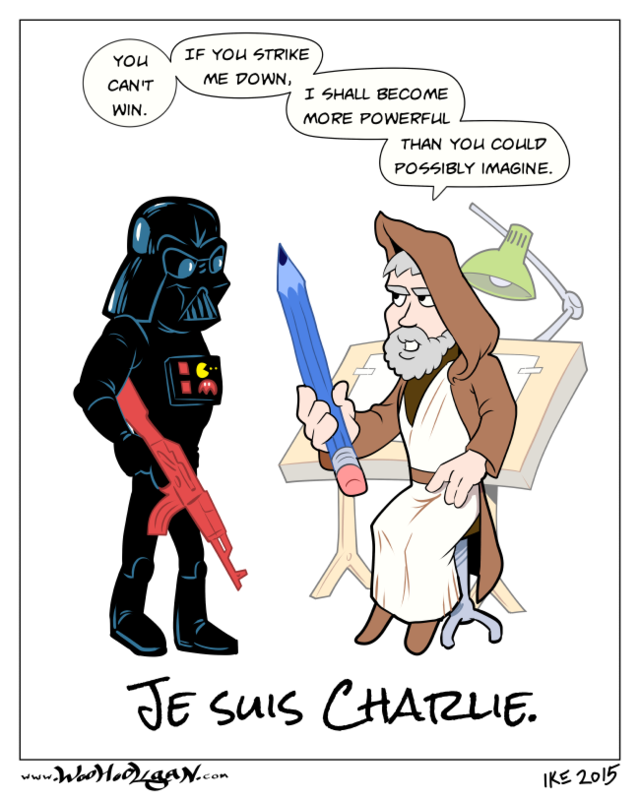 If you're still not sure why Je Suis Charlie became an international movement, I shared some of my thoughts on that subject in my DeviantArt journal. Wow man this is my favorite Je suis Charlie cartoon! Je suis Charlie - Thank you for that wonderful comment. Thank you, CJ. I'm glad you enjoyed it.